As a French girl living in London, I was quite surprised to see so many teens hanging around the streets of London on Friday and Saturday nights, completely drunk. We French certainly like to drink, heck, our cultural identity is entirely linked to the production and consumption of our treasured nectar. But as much as drinking is inherent to us (to the extent that your average charicature of a Frenchman will always include a red nose, a bottle, a baguette and some garlic) the sight of teenagers prancing about the streets of Paris in mini skirts and T-shirts on a cold December night, completely inebriated, is not one that I have ever witnessed. As I stood there watching them, huddled in my slightly less revealing outfit of three jumpers, two pairs of socks, trousers and a bobble hat, I must admit I was more than a little impressed by their sheer determination to get "lashed", as they say, when all I wanted was a cup of cacao. And yet, I'm hardly a non drinker, in fact I rather enjoy a good drink, so it made me wonder- do British "youths" really drink more than French ones? And if so, why? Dr Joffre, a specialist in treating addiction, helps us to answer these questions. So was my first impression right? Do young English people drink more than French ones or is it just their behaviour towards alcohol which is different? Maybe they are just more open about it and show it publicly whereas French ones hide themselves in houses? I asked a specialist, Dr Sabine Joffre who has created and has been running one of the rare medical centres helping alcoholic dependent people and drug-addicts in the hospital of Beaumont sur Oise. She confirmed my suspisions: Teenage alcohol abuse is a huge problem In England. But, what I didn't expect her to say that the situation in France is not that much better. On both sides of the Channel, the profile of your average drinker is changing, and not in a good way. Whereas the national average of alcohol consumption is falling, the age at which people first experiment with alcohol is decreasing. One could dismiss this as youthful fun, an occasional glass or two of wine too many, but unfortunately, alchohol abuse is all too frequently accompanied by other substances such as tobacco, weed and even more worryingly MDMA (ecstasy) and psychoactive medicines. Does this mean the kids are simply wasted and fit for the bin? Dr Joffre reminded me what Socrates used to say, during the fifth century BC, that youths were ill-bred and disrespectful. So, we should be prudent before being too harsh. However, concerning alcohol, tobacco and drugs a problem still remains: the earlier you start, the more addicted you are likely to become. Besides, neurological imagery showed that alcohol consumption during the early stages of adolescence causes a decrease of grey matter. Ouch! 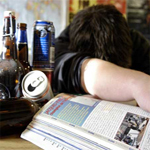 And short term, on top of the traditional hangover which teaches many teens the most powerful lesson about alcohol, drunkenness could also lead to black outs, alcohol-induced comas, high-risk sexuality, car accidents and/or acts of violence. Here are some figures: According to alcoholconcern.org, “British teenagers, together with those in Ireland and Denmark, are among the heaviest teenage drinkers in Europe; they are more likely to drink and get drunk. Among UK teenagers aged 15-16 56% report drinking more than 5 drinks on a single occasion in the last 30 days and 30% report doing this more than 3 times in the last month.” This type of behaviour toward alcohol has been called “binge drinking”: the aim is to get wasted as fast as possible. French teens are not much wiser: 46 per cent said they had drunk more than 4 drinks on a single occasion in the last 30 days, 2.3 per cent did this more than 10 times in the last 30 days! Dr Joffre confides that alcoholigical medical centers now cater for alcohol-addicts from 22-23 years old. So, Brit teens drink more than French ones. Or to be more accurate, British teens drink more often and regularly get drunk in the process, whereas French ones drink regularly too but get drunk in a less systematic way. It must be due to culture. I don’t want to be too cliché but this behaviour could be linked to the gap between pub-culture and café-culture, between a pint of beer and a glass of wine…Do you often see British students drinking a coffee and chatting after class? Nope. British young people meet in pubs where coffees and teas are not very common whilst French students meet in cafes where this is the norm. Another comparison is instructive: British girls are the first concerned by alcohol use in the UK! That means they drink more than boys! On the contrary in France we say “boire comme un homme” (“drink like a man”) and we could hardly imagine a man saying “Yesterday I drank like a woman”. Yet, British girls drink and are not ashamed to do so: they order pints and no one finds it strange. In France it would be regarded as vulgar. Whether you think that is misogynist or not, these social models influence alcohol consumption and protect French girls from heavy drinking. And this is quite good news since women are much more vulnerable to the effects of over-consumption. At least, let’s speak about the differences of consequences. As far as car accidents are concerned, France is without any doubt a the European counterexample. Despite political goodwill, prevention, restrictive laws and shocking advertisements, last year more than 8 per cent of fatal car accidents have involved both young people and alcohol. 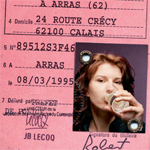 Driving is regarded as a sign of virility in France and in Southern European countries, regardless of the driver drinking he will use his own car. Happily, British people seem not to be concerned with this dangerous mentality and are not so afraid of using their feet. Well, the assessment we draw is alarming. However what could parents do to avoid problems caused by alcohol use? The simplest way seems to keep them locked at home... But, come on, you know that's not the best solution. First of all you don't have to be worried about alcohol use itself, it is a kind of initiation rite which is totally normal during the adolescence. But still, as remains Dr Joffre, teens are more vulnerable than adults, physically and mentally speaking. They are particularly exposed to the ambivalence of alcohol which could be a pleasure or a sign of distress, a factor of integration or of exclusion. Therefore, a special attention has to be paid to the modalities of drinking. If alcohol consumption remains rare and festive this could be OK but it's sometimes hard to find out if there's no psychological dependence, nor "craving". Consumption could also be auto-therapeutic to fill anxiety and shyness or even worst, addictive. In this case, teens look to get wasted, for forgetting a suffering that they could not express in another way. Social exclusion and marginalisation are most of the times parts of the infernal spiral. Help is urgent. Generally, teens have to be advised to choose moderation and to resist to social pressure. Pay attention to their behaviour towards alcohol and to any sign of distress. Concerning road security, it falls to anyone to remind to anyone not to drink if driving. Saving lives could be that easy. i am diabetic and 22 years old (i've had type 1 since i was 8) .i have a drink oacasionclly, but i dont drink beer (loaded with carbs) i usually drink sugar free redbull and vodka .it has never had much of an effect on my blood sugar but then again i dont let myself get drunk so i dont lose control. i had a diabetic friend die at the age 17 due to the fact that she funnelled way too many beers at a party and passed out and no one realized her blood sugar had shot up above 1000 and she flat lined and never came out of a coma. everything should be done in moderation. En effet, j'ai deux adolescents anglais a la maison et l'alcool semble etre une iniation a l'age adulte. On ne boit pas pour "socialise" mais pour etre plus saoul que son voisin.... mais ou les jeunes ados peuvent se rencontrer si ils ne font pas de sport? pas d'activité? serait ce une raison?